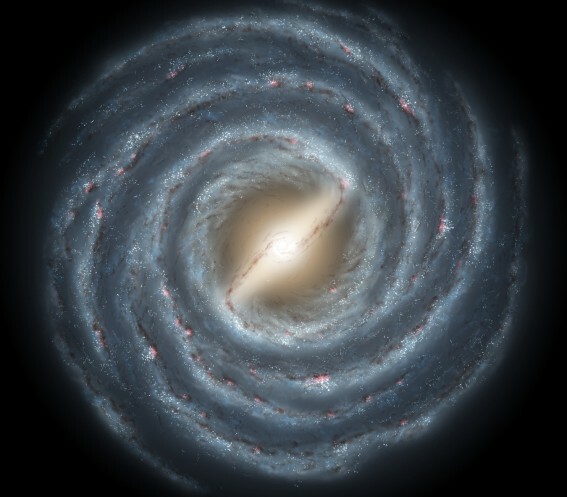 Galactic archaeology: dating the Milky Way's oldest stars helps reconstruct its past. Credit: R. Hurt/NASA/JPL-Caltech. Four dying stars in the Milky Way's halo are shedding fresh light on our Galaxy's birth. A new technique has revealed the stars' ages, and applying the same method to other stars should yield insight into how our Galaxy came together shortly after the big bang. To deduce the Milky Way's early evolution, astronomers must measure the ages of the oldest stars. Most of the Galaxy's stars, including the Sun, reside in a thin, pancake-shaped disk, but ancient stars populate a halo surrounding the disk. The halo's brightest members are tightly packed star clusters called globulars, whose ages are known from the color and brightness of their many stars. However, for every star in a globular star cluster, there exist roughly 100 halo stars on their own; dating them has been an enormous challenge. Astronomer Jason Kalirai of the Space Telescope Science Institute in Baltimore, Maryland, has created a new method to measure the ages of individual halo stars. His technique exploits a basic concept of stellar evolution: the heavier a star is, the faster it dies. Halo stars die by becoming red giants and then white dwarfs--dense stars little larger than Earth. White dwarfs have no nuclear activity, so as they age, they cool and fade. Thus, the hottest and brightest of these burnt-out stars entered the white-dwarf stage most recently. Kalirai first analyzed hot white dwarfs in the nearest globular star cluster, M4, which lies in the constellation Scorpius and is 12.5 billion years old. The spectra of the white dwarfs indicate the stars are 53 percent as massive as the Sun. Then Kalirai studied four hot white dwarfs that do not reside in a globular cluster but do belong to the inner halo, the component of the halo that dominates in the Sun's vicinity. All four are so hot--14,000 to 20,000 Kelvin--that they look blue, indicating that they became white dwarfs recently. Kalirai found that these white dwarfs are 55 percent as massive as the Sun, more massive than M4's newly minted white dwarfs, and so came from heavier and shorter-lived progenitors. As Kalirai reports online today in Nature, the four white dwarfs imply that the inner halo's age is around 11.4 billion years, younger than the oldest globular star clusters, which are 13.5 billion years old. "It's an exciting development," says astronomer Timothy Beers, director of Kitt Peak National Observatory in Tucson, Arizona. "Jason has a technique which appears to be about a factor of two more precise than what people have used for individual stars before." Beers says the same method can date not only more stars in the inner halo but also those in the outer halo, which prevails beyond the edge of the Milky Way's stellar disk. "That's exactly what I want to do in the future," says Kalirai. He expects, based on computer simulations of how galaxies form, that the outer halo is older. Its stars probably arose about 13.5 billion years ago in tiny galaxies that the Milky Way snatched for itself. "I would therefore predict that the masses of the white dwarfs that are being formed in that population right now are going to be about 10 percent smaller than the white dwarfs that I measured in the inner halo," he says. If Kalirai succeeds in establishing the ages of different parts of the halo, astronomers should have a clearer idea of the sequence of events that led to the galaxy's formation right after the big bang. Ken Croswell earned his Ph.D. in astronomy from Harvard University for studying the Galactic halo and is the author of The Alchemy of the Heavens and The Lives of Stars.